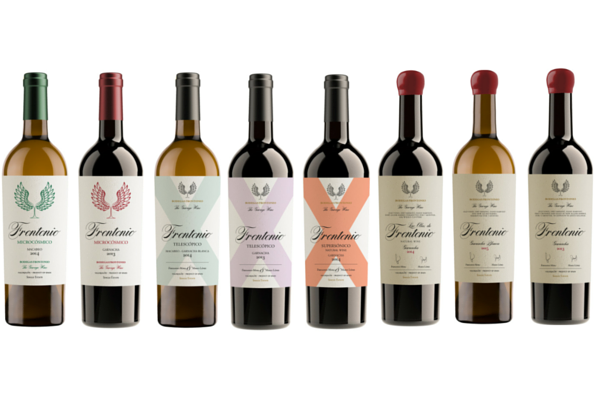 Long Wines’ winemaker and Master of Wine student Fernando Mora has re-launched his range of Frontonio wines with new, more premium packaging. Frontonio is named after Saint Frontonio, the patrón saint of Épila, a town in Valdejalón, North-East Spain, where the wines are produced. Legend has it that Saint Frontonio was beheaded by the Romans and his head was thrown into the River Ebro near Zaragoza. Miraculously, his head was later found going upstream along the banks of the River in Épila. An apt name for this limited production wines from a micro-winery that also goes against the tide, using only grapes from 35ha of low-yielding, un-irrigated vines from an almost unknown area – I.G.P. Valdejalón, vinified with the minimum of fuss using traditional foot pressing and indigenous yeasts, in concrete tanks in a garage in Épila, Aragón. Also something of a miracle. Supersónico- A light, pure and fresh garnacha aged for just 3-4 months in 300l oak barrels to round tannins with the minimum of additives, just 2g/Hl SO Only 3645 bottles were made of the current vintage. Frontonio – the pinnacle of the range, distinctive concentrated old vine garnacha blanca and tinta aged in Allier French oak for finesse and elegance. Very limited quantities: less than 800 bottles of the red and 400 of the white. The new packaging gives a more premium image to the range, which is already exported to over 18 international markets via Long Wines. For more information on the range contact the team at Long Wines.